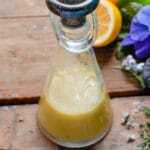 Light and bright this Meyer Lemon Salad Dressing doesn't compete or overwhelm salad greens; it celebrates them! Serving size note: serving size will vary depending on size of salad being dressed. Total salad dressing volume noted below. Add all ingredients to a jar; place lid on jar and tighten. Shake vigorously until all ingredients have blended together in an emulsion. Store sealed in refrigerator.